Fujitsu today announced the launch of its FUJITSU Manufacturing Industry Solution 3D Superimposed(1) Product Design Diagnostic, a PLM solution for manufacturers that visualizes differences between product component photos and their 3D blueprints. This solution is available today, initially only in Japan. In the manufacturing of large-scale structures, the 3D Superimposed Product Design Diagnostic solution enables users to overlay the blueprints of manufactured components created with 3D CAD on a picture of each component taken with a smartphone or tablet using AR technology(2) , making comparison easy. In addition, it can also greatly increase the efficiency of diagnostic procedures in which each manufacturing component previously had to be inspected visually or manually. Fujitsu continues to strengthen its manufacturing solutions, and represented by this solution, supports manufacturing with ICT on the front lines. In recent years, there has been a trend in which the scale of structures has been getting larger and more complex. It is therefore expected that the visual and manual process of accurately and efficiently judging whether a manufactured product aligns with its blueprints will become more and more problematic. Fujitsu has together with Tomoe Corporation, which operates businesses from general construction to steel towers, bridges and steel frames, developed a system that fuses 3D CAD and AR technology to analyze manufacturing components, and since 2015, conducted joint verification of its utility at Tomoe's Oyama factory. During this verification, in component assembly procedures in the manufacturing process, this system was able to reduce the time required to perform diagnostics for one manufactured component to one-tenth that of previous methods, cutting processing time to just a few minutes. 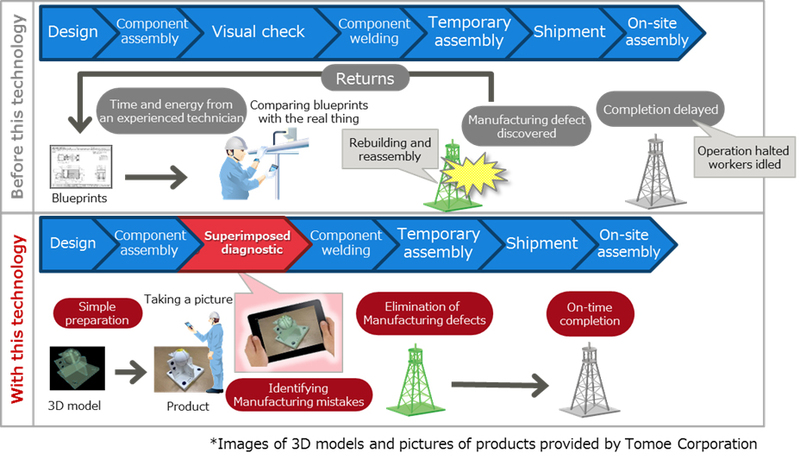 Now, to the core 3D superimposed diagnostic technology established in this operational trial, Fujitsu has added diagnostic preparation functionality aimed at improving task efficiency in manufacturing facilities, as well as management and usage functionality for the diagnostic results. Fujitsu is offering this product as the 3D Superimposed Product Design Diagnostic PLM solution. By superimposing 3D blueprints (STL files) over pictures of manufactured components taken with such devices as smartphones or tablets, the user is easily able to find if there are any differences. Because the diagnostic for each component will be completed in a few minutes, it enables diagnoses for all components, which was previously difficult due to time restrictions and other issues. In addition, the system enables early detection of manufacturing defects, eliminating the need to send items back during temporary assembly operations. The results of the diagnostic are saved, and can be used to share knowledge, improve management, and keep a record of quality. Fujitsu's goal is to implement the solution at 100 companies by fiscal 2019 (Fujitsu's fiscal year ends at the end of March). Overlaid. In this instance, 3D CAD data is overlaid on pictures of manufacturing components. Augmented reality. A technology in which the information gained from the human senses (reality) is overlaid with digital information obtained using ICT, expanding and enhancing human senses.